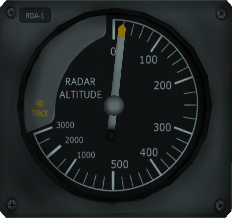 KSP's exterior view shows altitude above sea level ("ASL") at the top of the screen (actually altitude above the deepest point for planets without seas). That's not very useful when you're attempting to land in the dark or trying to conserve fuel by starting your landing burn as late as possible. What you want to see instead is altitude above ground level ("AGL"). Note that, like the RDA-1 altimeter, the display shows the altitude of the command module above the ground so when judging your landing you still have to account for the height of fuel tanks, landing legs etc below your command module. Put the "RadarAltitude" folder into your KSP installation's "GameData" folder. Joe Patrick's Radar Altimeter for 1.2 which performed a similar function, but which required a hotkey press to switch between ASL and AGL. I've installed the RadarAltitude folder in the GameData folder, but nothing happens ingame. Doesn't seem to work for me. Am I missing something? Edit: Nvm, didn't know/read that it only works when gears are activated. But it's now obsolete in KSP 1.7.0.